LaNette Laurie is our Office Manager. Prior to joining Maloney's Custom Ocular Prosthetics in 2002, LaNette held a senior management position with a major corporation for seventeen years, ranking in the top 5% nationally. 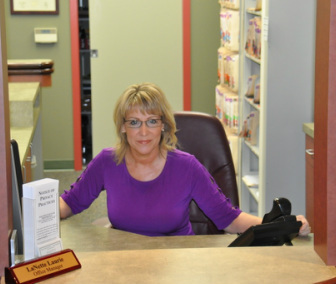 LaNette can assist you with insurance concerns, patient account questions, and scheduling appointments. LaNette also has the unique experience of walking patients through the prosthetic process, as a close family member has experienced the loss of an eye. In her spare time, LaNette enjoys traveling with her husband, photography, and scrap-booking.